Let me start by saying that I really love tabbouleh. 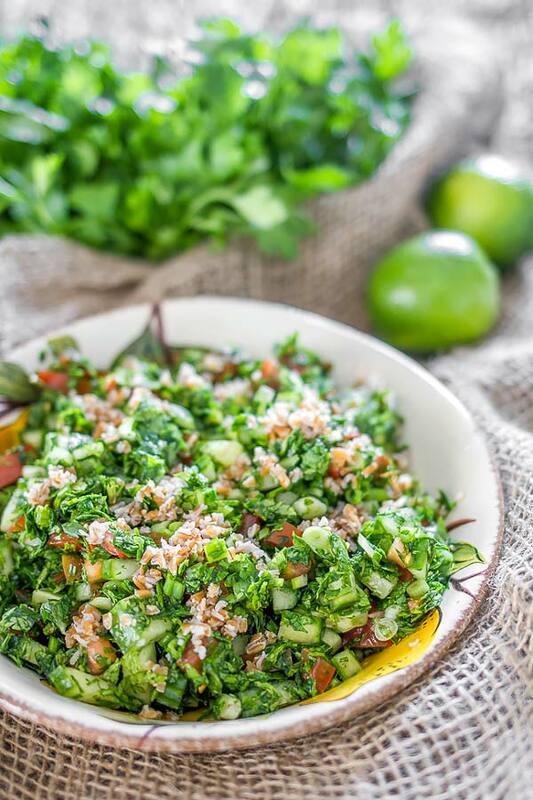 Though it has been a somewhat recent discovery of mine, the passion I always had for fresh parsley made this salad one of my favorites. Of Arabic origin, this salad is somewhat popular in North America though the majority of peeps still use parsley only as a simple garnish herb which is weird because aside from the fact that parsley has a ton of healthy benefits that not many know about, it is also freakin’ delicious, a flavour changer when added to various dishes. But as they say, to each his own, if you don’t like parsley, you don’t know what your’re missing. In Romania, we use parsley as a mandatory ingredient in most of our soups and stews and in some recipe even parsley root that looks a bit like parsnip but way better tasting. Good luck finding it in the grocery stores though because I couldn’t. Still, if you are willing to try this salad, make sure you buy Italian parsley and not the curly thing that doesn’t really taste like anything. The recipe also uses bulgur which is a cereal food and while I don’t care much about it, I wanted to stay as close to the original recipe as possible. I added cucumber, swapped lemons for limes and normal onions for green onions but that is just a personal preference. The end result was delicious and while it is probably enough salad here for four servings, I pretty much ate three of them in one sitting. Delicious! Add bulgur to a cup of hot water and let soak for 30 minutes or more, depending of how soft you want your bulgur to be. Whisk the lime zest, lime juice, olive oil, black pepper and salt together in a small bowl. Chop and cube all your veggies and mix everything in a large bowl. Add the soaked bulgur along with the dressing and toss.